Legendary skincare name Aesop’s first New Zealand store officially opened in September of last year in Newmarket, Auckland and good god she is beautiful. A trip there comes highly recommended - it’s a treat your senses that will render you almost unable to leave. Aesop is not your regular high-end skincare, haircare, home fragrance and more company. There are no big promises, no celebrity endorsements, no glossy packaging and no advertising. As a brand, they are committed to celebrating science by integrating both plant-based and laboratory-made ingredients, and the efficacy of their product formulations is world-renowned. An interview with Aesop General Manager of Retail and Customer Relations Suzanne Santos told us “you need a blend of well-chosen man-made ingredients with exceptional botanical ingredients to make remarkable products”, and I personally have never met an Aesop product I didn’t like. I first encountered the brand many years ago on a trip to Sydney and after washing my hands with their premier luxury soap, I was irrevocably hooked. Their less-is-more approach appeals to the type of consumer who doesn’t need fruity surroundings and overbearing retail staff to tell them what is wrong with their skin or what their home should smell like, but those who are happy to pay slightly higher prices for authentic top-quality products that just make you feel good – and work. Aesop’s founder Dennis Paphitis has famously been quoted as saying: “Luxury is an attitude, a spirit, a celebration of the everyday; it is certainly not an overpriced, monogrammed handbag that’s distributed as widely as fast food,” and their stores around the world reflect this value. Istros - a refined, floral and smoky aroma that I have been lucky enough to have been filling my home with that was named for an ancient Greek port town. In terms of fragrance notes, Istros is an uplifting blend of Pink Pepper, Lavender and Mimosa, layered with warm undertones of Cedar and Sandalwood. A hint of Tobacco lingers to ground its refined character. Olous - a vibrant blend of green and citrus botanicals that I think sounds perfect for the warmer months, Olous honours the city long lost to the Mediterranean seabed. It offers an olfactory melody of Grapefruit, Bergamot and Jasmine, matched delicately with Galbanum and Cardamom, Cedar and Incense. Cythera - a warm, woody and spicy fragrance that falls right in line with winter cocooning and celebrates its Hellenic namesake’s herculean spirit of resilience with a robust blend of Neroli, Geranium and Patchouli. A deft marriage with Ambrette and Myrrh results in a warm, woody and stirring aroma. For best results, the brand recommends that you spray two to three pumps throughout the immediate space and refresh as needed; the aroma seriously will last for several hours. 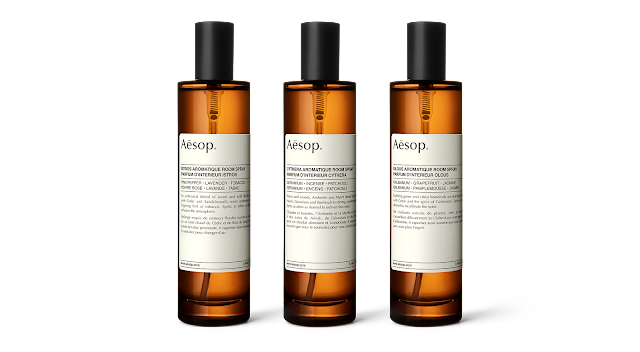 Oh and for a true sensorial delight, as an additional offer to clients, Aesop collaborated with American composer and musician Jesse Paris Smith to create three original tracks inspired by the aromas. 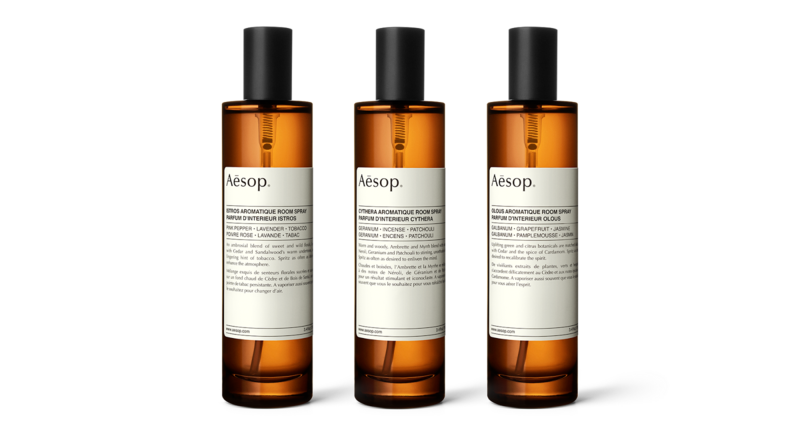 Available for complimentary download at aesop.com, each is designed to enhance the olfactory experience of the Room Sprays. Amazing. The heavenly Istros, Cythera and Olous Aromatique Room Sprays come packaged in 100 ml sleek, amber glass spray bottles, with an RRP of NZD$71.00. They will be available for individual purchase at Aesop signature stores, select department store counters and stockists globally from July 3, 2017, as well as Aesop Online.